Who will cover in the first four games of the NBA Playoffs? The two days of rest and preparation following the end of the regular season are over, and we've reached one of the best days on the sports calendar: the first day of the NBA playoffs. Things get underway on Saturday afternoon, with the Nets and 76ers tipping off a loaded quadruple-header. In the lead-up to the first games, there's been all sorts of discussion about who will win each series, and even who will go all the way to the Finals. At CBS Sports, our experts joined the chorus with their picks. But what about who will win each game? With four Game 1's on slate for the opening day of the postseason, let's take a look at some picks against the spread. So who wins Nets vs. Sixers? And which side of the spread has all the value? Visit SportsLine now to find out which side of the Nets vs. 76ers spread you need to jump on, all from the model that has crushed its NBA picks, and find out. The Sixers are the far more talented team in this first-round matchup, and yet they're only 5.5-point favorites in Game 1 at home. That's due almost entirely to the question marks surrounding the health of Joel Embiid. The star big man is still dealing with a sore knee, and said on Friday that he has "no idea" if he'll be able to play in Game 1. Judging by the line, it appears that oddsmakers are assuming he'll be out. It's obvious to anyone that a team missing their best player is not good, but few players have as much of an impact on their team as Embiid, who boasts a plus-11.3 net rating differential. With Embiid's potential absence, and how well the Nets played the Sixers in the regular season, it's understandable why there's a lot of interest in the Nets here. D'Angelo Russell has been awesome, they play hard and they know who they are. Still, with the line all the way down to 5.5 points there's some value on the Sixers here. Even without Embiid they would still have the four best players on the court, and they'll be at home where they were dynamite this season -- 31-10 with a plus-7.7 net rating -- in front of a raucous Philly crowd. When in doubt, ride with the talent. There's really no doubt here in terms of who is going to win the series -- that will be the Raptors -- but things could be interesting from a betting perspective in terms of the game-to-game spread. For Game 1, the Raptors are holding steady as 8.5-point favorites, which is a pretty sizeable spread for a playoff game -- especially with how well the Magic played to close the season. There's good reason for that line, though. First of all, the Raptors are just way better. Starting with Kawhi Leonard and going all the way down the starting lineup, they have the best player in every matchup, save for possibly center with how Nikola Vucevic is playing this season. Plus, for as well as the Magic closed the season, they did much of that work at home, and against non-playoff teams. Meanwhile, the Raptors were one of the best home teams -- 32-9, with a plus-7.1 net rating -- in the league. They should have little trouble winning this game by double digits. Who wins Clippers vs. Warriors? And which side of the spread can you bank on in over 60 percent of simulations? 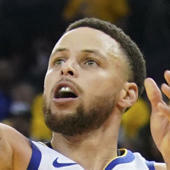 Visit SportsLine now to find out which side of the Clippers vs. Warriors spread you should be all over Saturday, all from the model that's up more than $4,000 on NBA picks this season. This is another first-round series where everyone knows the Warriors are going to win, and likely in four or five games. The question then becomes whether or not they can cover in those wins. In a clear sign of how little respect the Clippers are getting from oddsmakers in this series as the Warriors are 12.5-point favorites, which is by far the biggest line of the first day. Throughout the season, Warriors games were tricky to pick, especially with big lines. They were just 31-43-1 against the spread as favorites, and 10-8 ATS as double-digit favorites. But that was never due to their talent level, rather the fact that they were happy to coast at times in the regular season. That won't be the case in the playoffs and certainly not in Game 1. The Clippers will play really hard, but the Warriors are just too good. So who wins Spurs vs. Nuggets? And which side of the spread can you bank on in over 60 percent of simulations? Visit SportsLine now to find out which side of the Spurs vs. Nuggets spread you need to jump on Saturday, all from the model that has crushed its NBA picks, and find out. This is one of the most interesting first-round series, with all sorts of storylines and questions. The Nuggets are clearly the better squad overall, but they're also untested in the playoffs, and facing one of the league's most prestigious, steadfast franchises. Yet again, the Spurs are just a really solid, veteran-led team. Will talent or experience win out? It's a classic playoff question. In Game 1, though, the answer seems pretty obvious. The Nuggets were one of the most dominant home teams in the league this season, going 34-7 with a massive plus-10.6 net rating. Only the Bucks were better in that regard. Meanwhile, the Spurs were a nightmare on the road in the regular season. In terms of playoff teams, they have the worst road net rating at minus-3.6, and the second-worst road record at 16-25. The regular-season matchup between these two teams reflected those facts, with the home team winning each meeting. With the Nuggets at home this time, this feels like their game to lose.